Fatma Samoura of Senegal has been appointed Secretary General of FIFA. Her appointment was announced on 13 May 2016 at the 66th FIFA Congress in Mexico City. 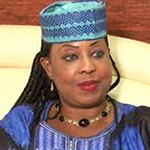 Born in Senegal in 1962, Fatma Samoura graduated with an English and Spanish master's from the University of Lyon as well as a Master in International Relations from the Institut d’études supérieures spécialisées de Strasbourg. Before being chosen for this new role, Samoura had a long career in the United Nations, where she held representation and management positions in six African countries (Djibouti, Cameroon, Chad, Guinea, Madagascar and Nigeria). Fatma Samoura brings to FIFA's 21 years of experience, acquired with the UN and prior to that in the private sector in the management and governance of organisations. Her challenge will be to complete the reform of the governing body of international football, including addressing the corruption scandals at the highest levels that have been making headlines for over a year.